(Strategies to reduce evasion include) Increased staffing, improve use and deployment of staff. By law, passengers are required to validate a ticket before every journey, and it is desirable to encourage this behaviour where possible, particularly in the light of the impending new ticketing system. However, it is not intended to enforce this by issuing a RONC in cases where an otherwise valid ticket has been initially validated but not re-validated for that journey as this behaviour is not classified as fare evasion. This one issue is likely to continue to be vexed under the new ticketing system. Page 21 considers attitudes to Authorised Offices and fines, noting that most people consider the size of fine is “out of touch”. Can only agree. $174 for a first fare evasion offence; and it goes up from there. The problem is a lot of regular evaders don’t get caught, so they’ve made the fine high to try and convince people to pay. I think a lower fine, with more regular checking, is a better way to cut evasion rates. Customers also believe the size of the fine is ‘out of touch’ with the magnitude of the offence. Depending on where you are in the system, as a consumer you will be faced with differences in ticket range, methods of payment, customer information and with a ticket which may be validated or not. Page 47 spells out that the CBD station gates are staffed only from 7am to 10pm. This was written by Connex, under their contract, but it doesn’t seem to have changed under Metro (I need to check the contract though). I find it surprising and disappointing they don’t staff until the last train, given large numbers of people still in the CBD most nights – surely consistency is important to remind people that you must have a ticket, no matter what time you’re travelling? Page 52 says there are only 12 bus AOs for the whole of Victoria. Mind you, most bus tickets get checked by the driver, so evasion is low, and is mostly concession fraud rather than not having a ticket at all. The majority of offences detected on buses relate to concession eligibility. …the Bus Association of Victoria has employed 12 full-time AOs to help reduce fare evasion across Melbourne and Regional Victoria. Page 54: Did they really not gazette (eg introduce into law) the Myki Fares+Ticketing Manual until well after Myki commenced on regional town buses?! That’s weird. There have been no reports of non compliance submitted since myki has commenced trialling, as the myki fares and ticketing manual has not been gazetted. Page 57 talks about V/Line, but makes no mention of problems with conductors being unable to walk through multiple-unit V/Locity trains to check tickets on the whole train. So on long trains they can only move through by swapping carriages at stations. Page 66 includes the total network-wide cost of fare evasion: $62,018,697 million per year, as-of the first half of 2009. The biggest cost is on trams ($35 million), followed by trains ($21.5 million) and buses ($5.5 million). 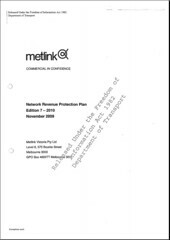 Page 72 notes that only around 2.39% of tram passengers get their tickets checked by Authorised Officers. It also includes figures for other modes (pages 67-72), but remember, on buses almost all tickets are checked by bus drivers as well, and on trains most passengers going through CBD and other major stations effectively get their tickets checked at the gates. The difference on trams is that tickets are only checked by AOs. So in other words, on any tram trip, you’ve only got a 1 in 41 chance of getting your ticket checked. 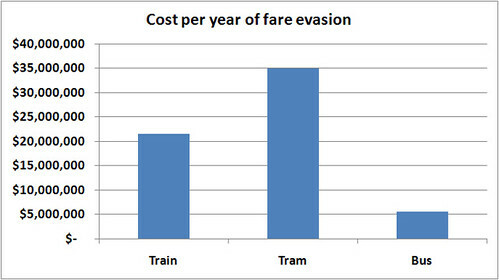 No wonder tram fare evasion is costing the most of the three modes. You can read the entire report yourself by accessing it from The Age’s web site. I get so cross when I travel on trams – seeing so many people just jumping on and off and making no effort to buy or validate tickets. It seems to me that this is where the system is haemorrhaging most rapidly. Again, it comes back to returning connies to the trams; if commuters know they’ll be faced with fare checks on at least one form of transport they’ll not only buy the ticket but the ongoing benefits from the conductors’ presence is multiplied with better courtesy on trams, smoother operation, etc, etc, etc. Roger, you could be fined for evading, eg by AOs at or outside Mt Waverley station for failing to touch-off (therefore not paying the zone 2 fare), or on the train back from Mt Waverley while still in zone 2 for failing to touch-on (and therefore no valid ticket). Also if your trip home starts after the original 2 hour fare expired, you get charged a default (two-zone) fare for the first trip anyway. Frank, your comments are typical of an unfortunate busybody culture in Victoria. It is none of your concern whether OTHER people validate on trams or not. I always have a monthly ticket and yet I never validate on trams because overvalidating a metcard mangles it and it will no longer open barriers at stations. Also, I want to protect my privacy. The stated aim of the requirement to revalidate, being the collection of data to ensure the adequacy of services, is a red herring because we know that there is no rolling stock to put on new services and it never happens without the government approving and paying for them in any case. Few other ticketing systems in the world require revalidating for every trip for long term tickets, and yet they still manage to put on enough services on. eg. Berlin, Zurich, Stockholm, Vienna, London. Also, the requirement to revalidate is typical of the nanny state mentality we have here, including this insatiable desire by the State government to know exactly where its citizens are and what we are doing at all times. Any time I have seen AOs swoop a tram most, if not all, prople have had valid tickets. So next time you get so upset about what other people are doing on trams, remember that there are broader issues at stake than simply whether someone is paying or not. thanks for your explantion. I didn’t realise you could be fined for not touching off! Andrew, yeah, see my post from last year about why revalidating is not that important. Roger, the offence would be evasion, not failing to touch-off, but yes, it could happen. I didn’t think you could be fined for not touching OFF, but you can be charged a default fare. * the ticket is scanned on, but not for the service that you are on. It should be noted the trains are one big service, but if you’re travelling in an unexpected direction (eg *towards* the touch-on location) then the AO will have reason to suspect an offence. How will more staff help? Already during business hours, people young and old jump the turnstiles, while the 5 foot 1 indian lady just stands and watches behind her spectacles while it happens again and again. Will two little indian ladies make a difference? I never re-validate my ticket on the tram, as long as it’s valid the I don’t see the point of sticking it in the machine time and time again. My tram route seems to have a lot of inspectors on it, in the last 6 months I’ve had my ticket checked quite a lot. Maybe I look dodgy! There should be guards at stations and trams and buses all the time and if people are fare invading then they should have a sheet in there files forever saying that they cant use public transport again. They should be behind bars for a while and then they should pay a big fine. Daniel, thanks for the link – I hadn’t seen your post from last year. An excellent summary of why revalidating is not important. It does seem to be Herald Sun reader types who lack a life to such an extent that they become obsessed about whether other people are following “rules” without considering the basis of those rules. I spent most of last year living in Berlin. I used to buy a monthly ticket, automatically validated at time of purchase for the calendar month and yet, magically, the BVG were able to put on enough services on the train, tram and underground networks at all times of the day, incl. 24 hours at weekends. I just add the privacy issue. This govt really is obsessed about knowing everything and the new registered mykis will enable them to know even more. andrew on Tue, 16th Mar – it is not so much a Victorian thing as the normative effect of the law. People get frustrated when they are obeying the rules, but someone else doesn’t (or is perceived as such) and gets away with it. p.s. Daniel – why are all the comments numbers as “1.”? Is it to stop the “FIRST!” posts? Grant, which web browser are you using? Chrome and Firefox appear to be showing comment numbers correctly, though I note IE6 is showing just dot points. It’s hard on weekends on VLine trains when the footy is on coming back down to Melbourne. The station I get on at isn’t open and you can only buy tickets on the train. A lot of times it is so packed I have to stand all the way into the city. The only way to stop fare evasion is to put barriers at all points of entry and exit to the system. As you say Busses have this in place with the driver although it seems as though they are not doing a very good ob. There’s no valid reason for fare-evasion on busses. The rail system has no reasons for not having physical barriers at all stations, I’m sure the 20million recovered in lost fares will compensate the employment of station masters. Which leaves trams and again there is no reason for not having a physical barrier at the point of entry and exit to all trams. It will require re-education of the commuter but it can be done. A vending machine behind the driver, a loby just inside the front door, a barrier between the vending machine and the rest of the tram. A barrier at the rear doors that is activated by weight on the step (or a ‘touch off’ under the new system). Front door entry only, rear door exit only, I know it’s been tried but without any conviction. 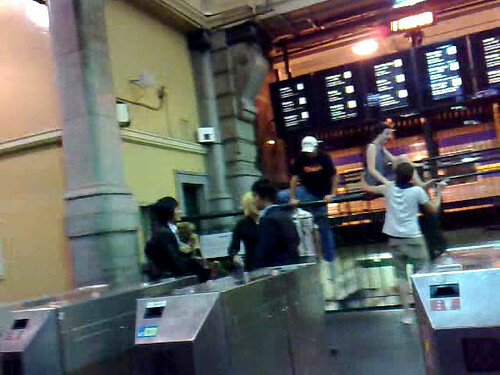 Passengers alight, those with tickets proceed through the barriers, those without wait in ‘lobby’ and purchase tickets before continuing into the vehicle. Any loiterers are kicked off the tram. No, the only way to stop fare evasion is a change in culture. Nigel, agree for trains. Buses, most of it is concession fraud. If you want bus drivers to insist on seeing a concession card when purchasing and also when a prepurchased concession ticket is presented, it could be reduced. Trams? No, I don’t think it’s practical. Show me anywhere in the world which has built barriers and gates into the vehicles and is able to take wheelchairs. Amsterdam used to do it, but with narrow doorways and steps. Using dedicated entry/exit doors used to slow down services, and would do so again; the size of the crowds at some stops make this impractical; you can barely get into the tram, let alone move along it to another door. (Ah, I see we’ve had this discussion before).